88 Marlborough is located on the south side of Marlborough, between Berkeley and Clarendon, with 86 Marlborough to the east and 90 Marlborough to the west. 88 Marlborough was built ca. 1872-1873 as the home of Susan Cabot (Jackson) Jackson, the widow of iron manufacturer Charles Jackson, Jr. Prior to his death in July of 1871, they had lived at 200 Beacon. Susan Jackson purchased the land for 88 Marlborough on September 7, 1871, from Miss Ann Wainwright Davis. It was the eastern 34 feet of a 60 foot wide lot; Ann Davis previously had sold the western 36 feet and it became part of the land on which 90 Marlborough would be built. The 60 foot parcel had been part of a 220 foot parcel that Henry Lee, Jr., and Jonathan Amory Davis, Ann Davis’s father, had purchased from the Commonwealth of Massachusetts on November 14, 1863. J. Amory Davis died in May of 1865 and his interest was inherited by his daughter. On October 6, 1865, she transferred her interest in the eastern 160 feet to Henry Lee, and he transferred his interest in the western 60 feet to her. 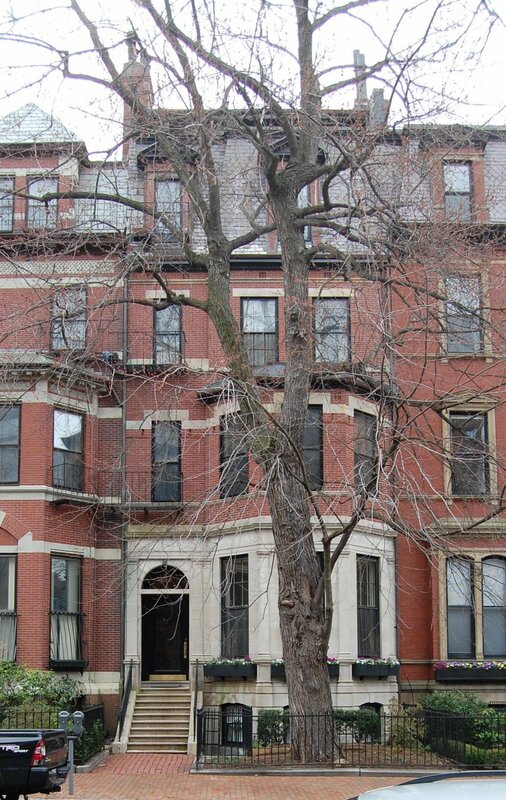 Click here for an index to the deeds for 88 Marlborough. Sarah Jackson’s three three unmarried children – Charles Cabot Jackson, a stockbroker, Marian Cabot Jackson, and Francis (Frank) Jackson, a stockbroker – lived with her. Her fourth child, Susan Cabot Jackson, had married in January of 1867 to Rev. George McKean Folsom, pastor of the Unitarian Church in Dedham. Susan (Jackson) Folsom had died in March of 1871. Charles Cabot Jackson married in June of 1876 to Frances Elizabeth Appleton and they moved to 20 Hereford. By 1878, Susan Jackson and her unmarried children had been joined at 88 Marlborough by her son-in-law, George M. Folsom, and grand-daughter, Amy Folsom. George Folsom had become a supervisor with the public schools. During the 1879-1880 winter season, Susan Jackson traveled abroad with Marian Jackson and Amy Folsom. They appear to have returned by mid-June (they are listed at 88 Marlborough in the 1880 US Census) but then probably traveled abroad again during the 1880-1881 season, accompanied by George M. Folsom. At about the same time, Frank Jackson moved to 57 Chestnut. During the 1879-1880 and 1880-1881 winter seasons, 88 Marlborough was the home of Richard Denison Rogers and his wife, Martha Endicott (Peabody) Rogers, and of Francis Peabody and his wife, Helen (Bloodgood) Peabody. Martha (Peabody) Rogers and Francis Peabody were siblings. During the previous season, they all had lived at 89 Marlborough (the home of Richard Rogers’s brother, Jacob C. Rogers). Their primary residence was in Danvers. Richard Rogers was treasurer of the Boott Cotton Mills, and Francis Peabody was president of the American Insurance Company. Susan Jackson, Marian Jackson, George Folsom, and Amy Folsom had resumed living at 88 Marlborough by the 1881-1882 winter season. George Folsom died in May of 1882 and Susan Jackson died in April of 1890. In her will, she left 88 Marlborough to her three children and her grand-daughter, Amy Folsom. On December 12, 1890, Charles Jackson transferred his share to Marian Jackson, Frank Jackson, and Amy Folsom. Frank Jackson moved back to 88 Marlborough and lived with his sister and his niece. They also maintained a home in Manchester. By 1905, Marian Jackson, Frank Jackson, and Amy Folsom had been joined at 88 Marlborough by Miss Mary Pratt. Frank Jackson moved from 88 Marlborough in about 1911 and on May 11, 1911, he transferred his interest in the house to his sister, Marian. On January 21, 1921, Marian Jackson transferred her interest in the property to Amy Folsom. Marian Jackson, Amy Folsom, and Mary Pratt continued to live at 88 Marlborough in 1922. By 1923, Marian Jackson and Amy Folsom had moved to 12 Marlborough. On November 4, 1922, 88 Marlborough was purchased from Amy Folsom by attorney Arthur Graham Mitton. He and his wife, Edith Beatrice (Carleton) Mitton, made it their home. They previously had lived in Brookline. They also maintained a home in East Gloucester until about 1931. In January of 1923, Arthur Mitton applied for (and subsequently received) permission for a “new front to second floor” and on April 12, 1923, he applied for (and subsequently received) permission to extend the rear bay up one story. The remodeling was designed by architect William D. Austin. 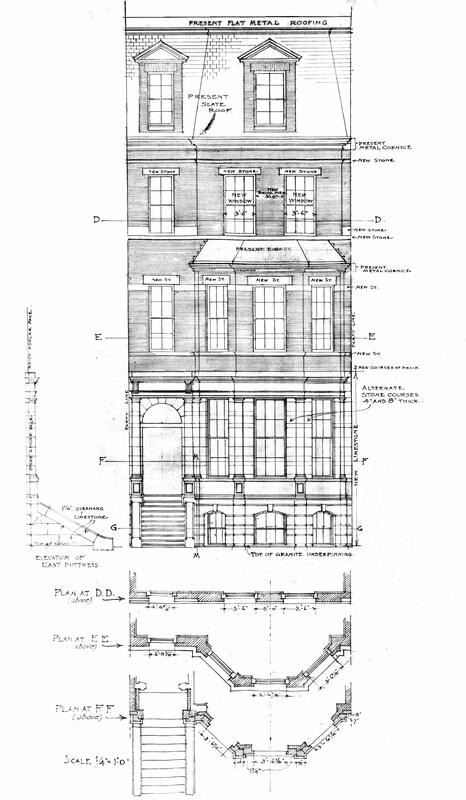 Plans for remodeling the front of the house, replacing the existing brownstone on the basement and first story with limestone, are included in the City of Boston Blueprints Collection in the Boston Public Library’s Arts Department (reference BIN M-43). On September 18, 1929, Arthur Mitton transferred the property into his and his wife’s names. The Mittons continued to live at 88 Marlborough in 1943. Their son, Arthur Mitton, Jr., who was serving in the US Army, lived with them. By 1945, Arthur and Edith Mitton had moved to the Hotel Sheraton at 91 Bay State Road, and 88 Marlborough had become Arthur Mitton, Jr.’s, home. On June 22, 1945, 88 Marlborough was acquired from the Mittons by former Governor Frank Gilman Allen. He and his wife, Eleanor Hamilton (Wallace) Allen, made it their Boston home. They also maintained homes in Norwood and Marblehead. Frank G. Allen was Chairman of the Board of Winslow Brothers and Smith Company, dealers in wool and sheep skins. He had served as Lieutenant Governor from 1925 to 1929, and as Governor from 1929 to 1931. They continued to at 88 Marlborough until his death in October of 1950. 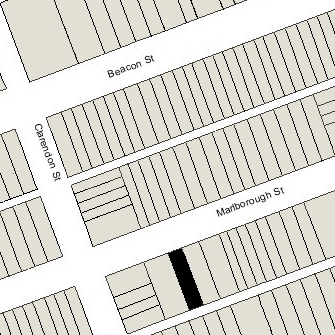 Eleanor Allen moved to an apartment at 65 Commonwealth, and 88 Marlborough was shown as vacant in the 1951 City Directory. On April 5, 1951, 88 Marlborough was acquired from Frank Allen’s estate by Dr. Martha Brunner-Orne, the wife of Dr. Frank Orne. She was a psychiatrist and expert on alcoholism, and he was an obstetrician and gynecologist. The lived in Westwood, where Martha Brunner-Orne was director of Westwood Lodge, a private sanatorium. 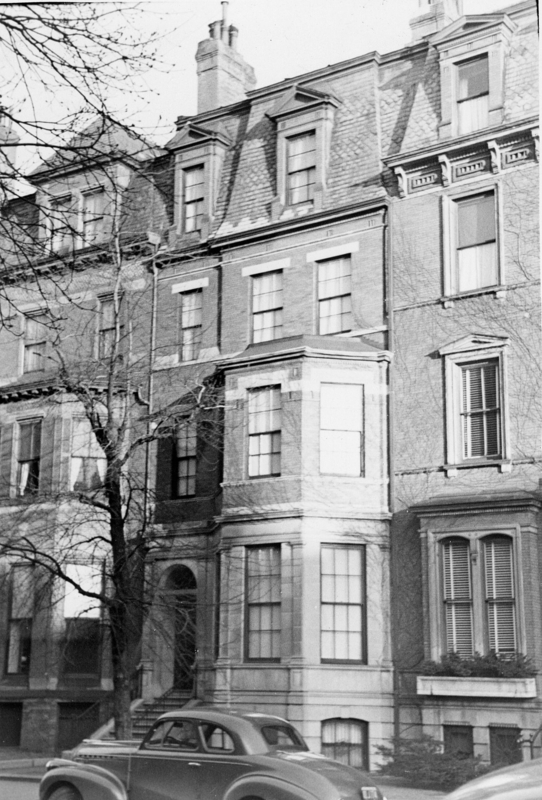 In August of 1951, they applied for (and subsequently received) permission to convert 88 Marlborough from a single-family dwelling into four doctors’ offices and five apartments. Frank Orne died in February of 1965, and Martha Brunner-Orne died in February of 1982. On April 29, 1983, 88 Marlborough was purchased from the Ornes’ sons, Martin T. Orne and Peter W. Orne, by Robert P. Kingman, trustee of The Lime Rock Realty Trust. In May of 1983, he applied for (and subsequently received) permission to remodel the property into six apartments. 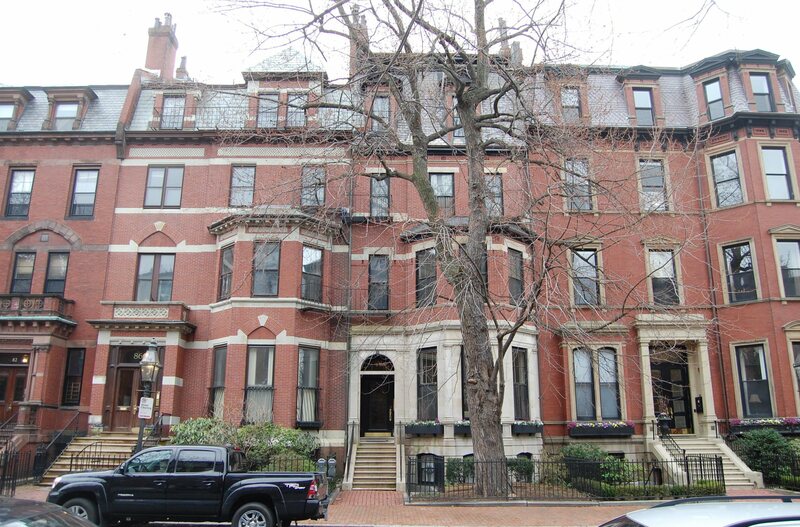 On March 4, 1987, Robert Kingman converted the property into six condominium units, the 88 Marlborough Street Condominium.